« WHO’S REALLY TO BLAME? Maybe that’s your impression of Christians. Maybe you think they’re fixated on death. Hey, there’s another one of their churches with a cross on it that they claim Jesus Christ died on. Every time one of those people gets on TV or radio or the Internet, they’re talk about Jesus dying. Man, that’s getting old. Yes, in the culture we all live in, the idea of a divine son of God (that’s who serious Christians believe Jesus is) being sacrificed for the “sins” of humanity is downright offensive. We’re all doing just fine, right? We haven’t ran over anyone with our car or robbed a bank or given anyone AIDS, so what’s the problem? This is where it gets controversial. 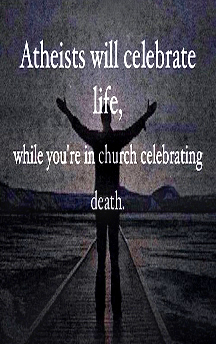 And this is why serious Christians appear to “celebrate” death. People who are genuine about following Jesus know that there’s a lot more to “doing fine” than avoiding prison or causing death. Those are just the big-ticket, headline-grabbing wrongs. How about greed? How big a TV do we actually need? Another IPad? Wasn’t the last one good enough? Hang on, a double garage and a big driveway just isn’t enough for your boat AND your trailer AND your three vehicles? Uh, didn’t you just go on a cruise last year? How about living your life as if God doesn’t exist? Genuine Christians believe what the Bible says, that “God loved the world so much that he gave his only Son, so that everyone who believes in him would not be lost but have eternal life” (that’s from a section simply called ‘John’). Furthermore, “God will wipe away every tear from their eyes. There will be no more death, sadness, crying, or pain” (from a section called ‘Revelation’). So, if you give the Bible any credibility, then those quotes above indicate that God does, indeed, care about YOU and deeply wants to be part of YOUR life. So is it wrong to live like He doesn’t exist? I would say yes. Now consider Christianity’s supposed “fixation” with death. What it’s really about — that this atheist graphic conveniently ignores — is that for those who believe in and truly follow Jesus Christ, His sacrificial death wipes all the bad things we’ve done and all the good things we’ve failed to do off the books. For those who follow Jesus seriously, God sees us like He sees His Son: pure, without the slightest imperfection. So the “fixation” is really about the results of Jesus’ death. It’s about something else, too. Serious Christians believe the Bible when it says that Jesus came back to life just a few days later — and in doing so, wiped out the permanence of death for all who believe in Him. So, in fact, what’s happening is opposite to the graphic. Genuine Christians are celebrating LIFE. And it’s a life that’s available to EVERYONE, no matter who they are, no matter what they’ve done (or not done). You’ve said it perfectly, Frank! As Christians, we know Jesus overcame the grave and we have eternal life in Him when we believe in Him as God’s Son.